Well, I’m certainly glad that weekend is over. My garden writer's group has a big annual meeting at Canada Blooms and I seem to be the organizer. Lots of work but lots of fun also. It’s great to connect with a group of like minded people. Sunday afternoon I was able to walk out on to the back deck and see this wonderful affirmation that spring is arriving. 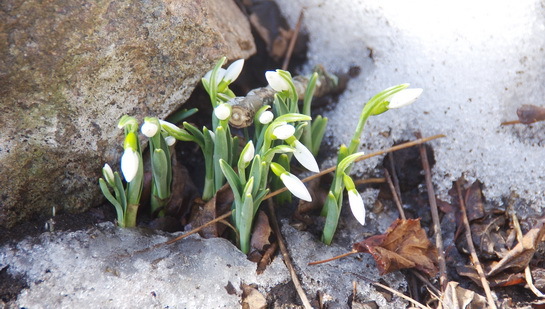 Those Snowdrops you see above popped out of the snow on Saturday afternoon. The presence of the dark coloured rock draws the heat from the sun and helps melt the snow to make these the first Snowdrops to show up. They will appear in several other spots in the garden as the sun works its way around and eventually melts all of the snow. In mid summer we probably wouldn’t even notice these little white flowers but at this time of year they are the biggest blooms in the garden and that is more than enough reason to plant them. Now you just have to remember that, next autumn, when choosing new bulbs to plant. Success and failure seem to be almost equal partners in the garden some days. The Lotus seeds that we have been carefully tending seem to be turning an ugly shade of black and I’m not feeling very hopeful about their survival. Both batches of Strawberry seeds are fully germinated and growing well along with a myriad of other seedlings that are developing rapidly, downstairs under the lights. Lots of work ahead this week transplanting all of those seedlings. That transplanting will necessitate increased space to grow them on. Oops! Mother Nature has given me another job to do before that can happen. I need to plug in the heating cables in the outdoor hot frame. The cable that runs the power from the house to the garage accumulated a huge icicle on it during the very cold February. 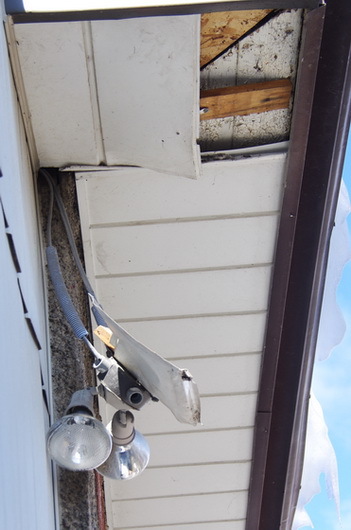 That Icicle was pretty but it became heavy enough to rip the outdoor light fixture, the soffit above it and the cable to the garage, completely free from the house. A rather unpleasant day of putting that all back together before I can heat the hot frame. There always seems to be two or three jobs to do before I can actually do the job I set out to accomplish. How can I replace that cable to the garage in a way that an icicle won’t make a home there next winter? One of the things that we do at our garden writer’s meeting is to provide all of the attendees with a variety of samples of new and interesting products that they can try and then tell the world about. I’ll be telling you about many of them through the next few weeks, as I try them out myself. I don’t need to try this one, I know that it is just what I need. The new tree that I planted behind the berm last fall will need watering a few times before it gets itself established enough to survive on the rainfall that Mother Nature provides. The fine folks at Dramm make a variety of great watering equipment. 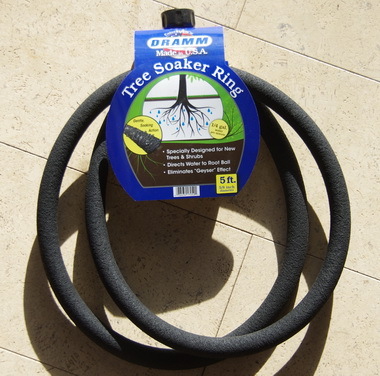 This new small circular soaker hose is perfect for putting around that new tree and gently watering it. The soil won’t get splashed and moved by a stream of water hitting it and it will get enough water because I won’t get tired of carrying a few pailfuls back to it. What a great idea. Of course I will have to have enough hose to reach all the way back there but Dramm sells some wonderful hose as well. Debbie Asks? Sorry to hear you had no questions..I have many but just never get them posted ..What is the best way to get canna lilies started Mine are barely ready to bloom by winter? Ken Answers! Canna's foliage is one of its best features and they do bloom later in the summer. I start mine indoors or in the cold frame by the end of March to make sure they get big enough to bloom by mid summer. You do need a fair bit of space to pot up and grow those big rhizomes. Jill Asks? I am beginning seeds for vegetables and flowers this year indoors for the first time. Do I turn the grow lights on during the day when energy costs a premium or at night when energy cost less? Many of my seed packets say that the temperature should be around 70 degrees in the day and lowered to 60 degrees at night. I have heat pads so do I turn them on for the day and off at night? or does it matter that heat + lights are on for 12 hours at night??? Ken Answers! We wash our dishes and our clothes at night but I must confess it's hard to light my plants then, as I use 16 hrs on and 8 hrs off. My heated germination area is heated all the time and when the seedlings are transplanted they move under the other lights with no supplementary heat, they probably get fairly study 65F and a bit cooler at night when the whole house is cooler. It would be confusing for them to light them at night when the air temperature is cooler. The dark and the cool need to happen at the same time. There, I've probably confused you even more. The fluorescent tubes don't draw that much power so I don't worry about off peak times. Dan Asks? Cabin and spring fever are fully set in. 2 Questions. #1 - When should I start splitting up my Elephant Ear plants (they are currently in large planters) and start bringing them to life? #2 - Is it safe this season to return Impatiens to our gardens and landscapes? Ken Answers! I start my Elephant ears (Colocasia sp) about the end of March. It greatly depends on how much room you have to accommodate the growing plants. Impatiens, Now that's a really good question with no definitive answer. The spores of Downy Mildew apparently survive in the soil for at least two years. I did see some being grown, apparently successfully in early August last year. I don't believe that any of the big growers are planning a resurgence in production but you could try a few from seed and see what happens. That's as close as I get to a non answer.